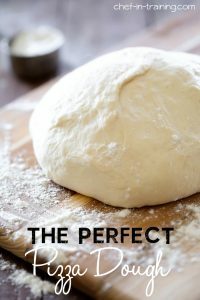 This Perfect Pizza Dough Recipe only requires 10 minutes of rest time and is perfection each and every time! It will be the best and only pizza dough recipe you ever need! About 4 or 5 years ago, we had my brother-in-law, Jeff, and sister-in-law, Katie, over to our house for dinner. While the boys were out golfing, Katie and I brainstormed on what to make. That is when she first introduced me to the fool-proof pizza dough recipe her aunt had given to her. It is seriously SO simple, is almost IMPOSSIBLE to mess up (if you do mess it up, I would really be curious to hear about it) and only requires 15 minutes of rise time. Does it get any easier or faster than that when making bread dough? Not that I have encountered. I recently made a delicious pizza using this dough recipe (recipe coming later) that I am super excited to share. But first we have to start with the basic recipes to get to later recipes right? So here is this recipe. Save it. Print it. Use it. You won’t go back to any other pizza dough recipe ever again! The recipe is virtually fool-proof! Makes perfect pizza dough every time! Mix warm water and yeast and let sit 5 minutes until yeast proofs. Add 2 ½ cups flour with proofed yeast and mix well in Kitchen Aid or with a dough hook. Add additional 2 ½ cups flour and salt, knead until smooth. Cover bowl with saran wrap. Let dough rest in a ball for 10 to 20 minutes. Pour 2 tablespoons of olive oil onto baking sheet or pizza pan and evenly coat bottom of baking sheet or pizza pan. Remove dough from bowl and add more flour as needed (a little at a time) to alleviate the stickiness of the dough if needed. I add a few Tablespoons usually. Split dough in half and roll each ball of dough very thin and place on greased pan. Now comes the fun part! Top your pizza dough however you would like. If you have a favorite pizza recipe or breadstick recipe, have at it! Be sure and leave a ¾-inch space on the edge for crust. Bake each pizza separately at 400 degrees F for 18-20 minutes for pizza and 15 minutes for bread sticks or cinnamon sticks. I've been looking for the perfect pizza dough forever! This is excellent, I've been looking for a good crust recipe! Have you ever tried making this with whole wheat? This is my favorite pizza dough recipe. I love that you have your go-to pizza dough recipe. I have one that's ready in an hour and a whole wheat one, but yours is even faster! Love that. Pinned! You can never EVER go wrong with pizza! Looks perfect! Do you have a recipe for homemade sauce? you are looking for a sauce recipe! _--_ you can add or delete brown sugar as you like it, you can put a little at a time till it taste good to you, play around with spices as you wish. Seriously great pizza crust! We make homemade pizza on most Friday's and this is a keeper. It will be my new go to crust from now on! And with only a 15 minute rise timI I no longer have to start dough at 3:30 in the afternoon! Thank you! Can this dough be frozen? I love to make a bunch of pizzas during a slow day. Top with sauce and cheese and then wrap them and freeze them. We then pull them out on busy night and but toppings on them. Saves money from buying store bought frozen pizza. Yes! It froze beautifully for me. Is a tablespoon of yeast one packet? Typically, the packets of yeast are 2 1/4 teaspoons. I really enjoy your blog, however, you have so many ads that pop up when opening your posts that it takes forever to load. This looks like a great pizza dough, I can't wait to try it! This sounds great! You don't specify which kind of yeast, I'm guessing it has to be quick-rise since that's only 15 minutes. Since the recipe calls for proofing, use traditional yeast. I am attempting it with 'pizza yeast' right now... which is not quite a quick rise, as it still requires (minimal) proofing, yet gives a quicker rise. We'll see how that turns out. can you freeze this dough to use some or all of it later? If yes, what is the process for thawing and then using? Thanks for the question and answer. I was just wondering this. Have a great day! Very nice! But I'm wondering how does the the dough rise without sugar in the recipe? You only need flour, water, salt, and yeast to make great bread. When flour mixes with water, its own natural enzymes are released to turn the starches into simple sugars. this is about the same recipe my daughter uses & her pizza dough is the best! We like thin crust best, though so get 3 large pizzas from this amount of dough. Also, she doesn't roll it out first, just puts a piece of dough in the pan & presses it out. No commercial pizza can compare. I forgot to mention that daughter also pre-bakes about 5 - 8 minutes before putting on toppings. she drizzles with a bit more olive oil before topping. At this point the pizza can be removed from the pan if you want & finished either directly on the oven rack or on the grill. As I said we prefer thin & crispy - if you like thicker crust these methods probably wouldn't work for you. Hey can't wait to try this one out, been looking for a good pizza base recipe. quick question which flour to use? Plain? Self Raising? strong? etc. Or any? Also is there a type of yeast we need to use? the store i went to had yeast flakes - is this the same as yeast? do i use the same amount? thanks! I have never heard of yeast flakes before so I am unsure of how to use them. I used active dry yeast for this recipe. Sorry I can't be of more help. Yeast flakes usually refers to nutritional yeast which is NOT the yeast used for baking/rising. It is usually added to granolas and other baked goods for added nutrition, not for leavening. It will not help dough rise. I've been making pizza dough like this for years. I have never once used sugar and it turns out perfect every time. The purpose that we are adding sugar is the food for yeast. Maybe pour flour into measuring cup? Sift & pour into cup? or the scoop method? I'm looking forward to trying this. My daughters and I love making pizza together. Hi, Frank. To measure flour, spoon the flour into the measuring cup. Don't pack it in, it should be loose. Overfill and then level with a knife. Hope this helps! I was sold at "Fool proof" :-) And I like that it's quick and easy.. just a 10 min waiting time. Perfect! Will give it a try. what kind of yeast? cake or rapid? I have made pizza dough using this method for more than 20 years. When it failed, it was a yeast problem...unfortunately it just doesn't last forever! One of my family's favourites is Bread Wedges. Make your crust and pour on zesty Italian salad dressing. Top with mozzarella and parmesan and bake until done. I like to do pizza in a hot oven-400F I have also mixed in a blend of Italian herbs into the flour incorporating a bit more flavour into the dough. Have fun with it and don't be afraid to experiment. Nice... but let me know.. you used 21/2 cup of flour so it is for 2 cup of warm water..
Do you think this could be made with whole wheat flour instead of regular flower? Can i frozen the dough for next time use? I haven't read any of your comments yet, so I don't know if this has been mentioned, but you could totally grill this pizza dough. Preheat your grill. Dip a paper towel in your choice of oil and using long tongs, brush your grill with the paper towel (make sure you clean the grates before doing this). Place pizza dough on your grill and cover and bake for 3-5 mins, depending on how hot it is. Take the dough off the grill and immediately decorate the cooked side of your dough with your favorite toppings. Place your pizza back on the grill (the raw side of the dough will be on the grill now) and cover and bake till toppings are done. I love grilling pizza and I usually split the dough into personal sized pizzas for each member of my family. They can create their favorite pizza and not have to share. Thanks for the recipe. I do this all the time with this recipe. I roll out individual pizzas cook them on the grill just a couple minutes then put toppings on and put them back on the grill until the cheese melts. The crusts freeze great too. Is this recipe made with bread flour or all-purpose flour! I only had bread and cake flour on hand, used half and half and turned out great! Recipe looks good. One thing I'm not sure how it'll work with this recipe, but when I make home made pizza dough I don't use oil to coat the pan. I simply sprinkle some flour on the bottom. Helps the pizza come out crispier and not soggy. Does this recipe take NO SUGAR? I don't see any mixed with the yeast...I wondered if your recipe was missing it? I would love to try this recipe but I don't have a dough hook or a Kitchen Aid! Would a food processor work instead? I always use my food processor, but on a low speed. This was exactly as advertised and so easy, thanks so much! It was a little salty for my taste so I might cut that slightly but that is just personal preference as my husband loved it. I froze some and thawed in the refrigerator and it worked so well. I am back here to look up the recipe again for dinner and to load the freezer so we have some on hand when I have a baby in a couple weeks! So fantastic! The yeast just didnt proof! Do i use all the water to 1 tablespoon of yeast? When i reduced the water to 1/2 cup then it was fine. So should i increase the yeast for all the water? I made the Pizza Dough recipe with my 7yr old son last night and it was easy, fun, quick and delicious! I couldn't believe how foolproof this recipe was for a perfect pizza crust. thanks for all your recipes! I have five crazy kiddos and they've loved everything I've made from what you've posted!! Thanks SOOO much! I use a version of this recipe all the time. The only difference is, I make half as much to make two 14 inch round pizzas, or one rectangular thick crust. I don't bother proofing the yeast (mixing it with the water first), and I use a whole dry yeast packet (2.25 tsp.) with only 1 cup water to just under 3 cups of flour. I only use 1 tsp. of salt, and add 2 Tablespoons of vegetable oil to the dough instead off the pan. Once it is kneeded (I use a dough hook and a Kitchenaid mixer), it only needs to rest 10 minutes before rolling or pressing out and topping. I never prebake the pizza crust, unless I plan to freeze it. Otherwise, 18 minutes at 400 degrees will cook it through. I've used baking stones or cookie sheets just sprayed with cooking spray, and they both work well. No sugar needed, unless you prefer sweeter dough (we don't). For freezing, bake the crust 5 minutes until it is barely light brown, let cool, then add toppings, wrap in plastic wrap or foil, and freeze. It can go straight from freezer to oven and bake at 400 degrees. To make a stuffed crust, use mozzarella cheese ( I use an 8 ounce brick) sliced into small rectangles. Mine are the short end of the cheese brick, cut in slices, and then cut in half. Place the slices on the outside edge of the pizza, and wrap the dough around them and press to seal the edge. The thick edge holds the toppings in well, and my kids eat the crusts better. No additional cooking time needed, but some cheese may leak out. Doesn't hurt a thing. Yummy! We can our own pizza sauce, but we just use Mrs. Wages brand packages, because that's the flavor we like best. Enjoy! Instead of dividing the dough for 2 pizzas can I use the whole amount and make a deep dish pizza? You should specify the type of flour used! There is a huge difference between bread and all purpose flour. Do you use self rising or plain flour? Made this today. It was easy and tasted good but the bottom was SO HARD. Bad hard. We used a pre heated stone instead of a pan, lowest rack, same temp and time. Any ideas how to bake it so the crust is cooked but not so hard, preferably still on a stone? I would first not preheat the stone and, secondly, not put it on the lowest rack, closest to the heat source. In my experience, and a Pampered Chef consultant who works with stones, preheating them is not necessary and could prove disastrous if the food you're putting on them is cold, resulting in thermal shock. Putting a cold pizza stone in a pre-heated oven causes the stone to crack - that is where the temperature shock comes from. I used this for Pepperoni Rolls for me and the hubby. He loved them. Made about 8 rolls, served with spanish rice and it was awesome! First time user of dough hook. What speed do you use for the dough hook? Also do you grease your bowl for the dough ball to rest in? Hi is this instant yeast or which kind? When adding the additional 2-1/2 cups of flour, do you have to knead by hand, or will the Kitchen Aid with dough hook do the kneading? Stir in with spoon then let dough hook take over. I love it and give it five stars! well done! Wow does this look easy! A question... I always use a pizza stone. Can I use it for this recipe? Any other way to make if you don't have dough hooks or a kitchen aid? Knead by hand is as old and good as anything. Will just take longer to prepare. Can I make this in my bread machine on the pizza dough setting? Yes, a bread machine can be used. That is how I do mine. Works every time! You do not mention how many pizza this amount of flour makes, as well as the brand of flour used. Personally, I tried different flour without any great success until I came across 'LAUCKE' flour. I have never looked back and my pizza comes out perfect every time. For 2 of us, I use 1 1/2 cup with 2 extra spoons. However, I will definitely give your recipe a go next time. Perhaps a good recipe, but 1 tablespoon of salt is simply too much. I'm thinking that not only did it make it too salty but it inhibited the yeast. Worth playing with though. I messed it up- I have a Bosch mixer and I did the 2 1/2 cups flour and then the other 2 1/2 and it was hard as a rock wayyy too much flour so I through that dough away and slowly added the flour in and only needed about 4 cups tops and it was perfect! Now I have made it about 3 times and it turns out great every time! Could you please give the measurement in grams ? If you Google I bet you could find the measurements you're looking for. It's my go to when I am stumped by something. Then pin if you. It will always be there for you ???? American cups to grams weigh different depending on the type of flour. I assume this recipie uses american cups etc. but cups are not standard size around the world - so I firstly have to assume it is american. I came to the comments to try and find the conversion to grams/any other universal measurement I could use. I usually avoid american recipies (for a few reasons) mostly because they are so hard to convert to useable, universal measurements. The differing proportions ultimatly means recipies from the US never work for me. I am not sure if it is because the recipies themselves are bad (some are but most are not), or the measurements just do not translate. I will try this tonight. I have been making pizza since I was about 9 (seriously, my grandmother found a recipe in The Chicago Tribune and my aunt and I made it weekly) but have been looking for a good update for the dough portion of the recipe. This looks like it might be it. Thanks. And now I've found another great site! Sorry, but I'm still searching for that perfect pizza dough recipe! What type of flour ? I just made this for my family. Turned out super good. I changed it a little though. I added a tablespoon of sugar to the water and yeast. I also used half whole wheat and half white flour, I also used quick rise yeast. I rolled the balls in some corn meal before putting them in the pans for a little added crunch. I also didnt have olive oil so used veggie oil instead. Nice and crispy and light. I will modify it a little more for my own taste, but a very good base recipe. Thanks! Just made the dough last night. It is fantastic! My first attempt at homemade pizza was a success. Thank you for sharing! So glad I found this, I have never made pizza dough before but didn't feel like running to the store to buy refrigerated dough. It was super easy to make and smells great! Can't wait to eat it! I made a double batch last weekend and froze half of it, it thawed and cooked perfectly! It says you split into two pans but how big are those pans? I usually just make a big pizza with my large cookie sheet. Would this recipe be enough dough? I super loved the texture of this dough! It bakes up nice and fluffy. I thought it tasted a bit on the bitter side, though, so I did add about 1 1/2 tbsp. of sugar to my recipe. I also used Crisco on the pan and put 2 tbsp. of oil straight into the dough mixture. Thanks for sharing this recipe. Making homemade pizza dough is on the top of my lists of things to cook! Definitely going to try this! I love the reciepes that i have seen so far and was wondering if you have one for home made bread. My mom used to make bread all the time but never wrote down the recipe she did it all by memory.She tried to write it down for me but she never measured anything. It was a pinch of this a dash of that. Thanks. Really enjoy your site. How do you make the cinnamon sticks with the pizza dough? We plan on making pizza tomorrow. When you say mix with a kichenaid do you mean a food processor? Or a kitchen aid mixer with a dough hook? Great! I wrapped the second dough ball up and popped it into the freezer. It tasted just as good! What size pizza(s) does this recipe make? I would love to make this but, I don't have any of those mixers. Can you use something else or even your hands? The pizza dough was amazing! Loved the recipe and all of us enjoyed how soft and fluffy it was and didn't get soggy with the toppings on top! Thank you for the recipe! It's a keeper. I just tried this tonight, and it was so good! It was so simple and easy, and my husband loved it! I am going to try and make a stuffed crust next time. Would love to make my own crust. But in your instructions you say to use a Kitchen Aid or dough hook , I do not own either one. Just have a regular hand held. Will that be enough to mix the ingredients correctly ? Thank you ! You can start any bread with a hand mixer, just use less flour to start and mix until you see the change in texture. Then stir in the remaining flour a little at a time. If you use all the flour she adds to a kitchen aid it will be too hard on your mixer. This is the same recipe I've been using since probably before you were born! It is foolproof. However, lately I've been jazzing it up a bit by adding about 3/4 - 1 tsp of dried oregano and about 1 Tbsp of grated Parmesan cheese to the mix. Just gives the crust another layer of taste. But the original is great, for sure. This is the best pizza dough recipe I've ever used. I'd never made any that didn't call for sugar & oil, I didn't know what to expect & it's now my go-to recipe for pizza dough. I made stromboli with it also, it was very good. Thank for sharing the recipe. Is there any way to freeze this dough after you make it?? Will it stay fresh until later use? I was almost skeptical of how this would taste because it is so simple, but it is amazing. By far, my favorite pizza dough recipe I've tried! I'm sure I annoyed my husband the first time I made it because I kept going on at how good it was! Can this recipe be used for making Pizza on a grill or campfire? Loved it!! Today my four year old daughter and I made it for dinner. We had fun and of course it taste awesome. Do you have any recipes that are good for diabetic options? I would love to make a pizza that is low carb. Love home made Italian food. thanks for the help. I am on a limited diet and craved craved pizza. It was fun to make and was well worth it. This recipe has the same ingredients that I use to make back from the late 80's. Unfortunately, I lost the recipe. This a great recipe, and I will try this! Thanks for sharing! This is amazing! I made ham and cheese rolls with this dough and they came out amazing! Husband approved! Im sending them with the kids to school tomorrow hopefully they will like them too. Thanks dor this post! Hey so I have a few queries. First about the oiling part. Baking sheet as in baking paper right? And under the baking sheet means on the tray? Also, to roll the dough thin..how thin are we talking about here?? Please help! I swapped out whole wheat flour cup-for-cup with the AP flour and added 1T of Italian herbs. Turned out amazing! This dough freezes very very. I only needed half one night so froze the other half for later in the week. Excellent both times. I have made this doygh numerous times, it's excellent and fool proof....Thank you ! My one question......can i freeze it? I assume after it has sat and risen i can split it into the amounts i want and put it infreezer bags into the freezer? My children just loved this pizza dough. It was delicious and I will continue using it for sure. Thank you Nikki and also for your other recipes which, I look forward, in trying. What size pan? Does it need to be cast iron or stone or just my junky old cookie sheet? Any suggestions for using a pizza stone? Does this recipe need to be adjusted for high altitude? is there supposed to be sugar in the recipe to activate the yeast? Great recipe and very easy to make! I've never made a pizza dough without sugar but it wasn't at all noticeable. The only thing I did notice was that it was very salty. I will definitely use this recipe again only I will cut the salt by half. Can this be made the day before, put in the fridge overnight and used the next day? BTW...I've made this and love how you get to make your pizza within an hour, really a good recipe. Thank you. This makes the best dough!! I let mine rise a lot more because I had time too, and it stretched into the pans without any effort!! I make peperroni bread, and sausage, onion and pepper bread with it...its baking now, I will let you know the final outcome, but so far so good Brava girl! I made this today and it has to be the best pizza dough I have ever tasted. So long store bought. Does this recipe yield 2 pizza's? I added Italian seasoning and Parmesan cheese to it. It was great! When we make pizza we put an excessive amount of toppings on and I find if I am using raw dough, it doesn't cook in the middle if I don't cook it first. If I were to cook it first, how long would you recommend?? Thanks for this recipe. I always pre-cook my pizza dough for about 8 mins then add toppings and chuck back in oven for 15 mins or so because I hate having a soggy bottom. I am wondering if this is necessary and guess other people probably don't do that? Sounds absolutely wonderful! I've been looking for a good pizza dough recipe and this could be the one. I do have one question; can you refrigerate or freeze the dough? Thank you! Would it hurt to make this dough a few days ahead of time and let it sit in the fridge? Looking to make it over the weekend and use it Monday or tuesday? Great. Love my pizza...I do the same but I add some honey. Just curious why no sugar or honey? I don't have a kitchen aid or a dough hook with me, all i have with me is a simple blender. Can you tell me how many minutes of hand kneading is required to prepare the dough ? Hi, what happens if I make this dough a few hours before I need to pan it for the pizza? Will it still rise when I roll and pan it? Why did you not add sugar? This is a good recipe but I added about a half cup of flour. I used bread flour. I also let the dough rise a little in a oiled bowl before punching it down to put in the pan. It takes a little longer but the crust was better. I like a soft crust. I made the pizza dough yesterday (first time making dough) I turned out fantastic! A keeper for sure. Quick question can this sough be used for any other recipes? Like breads? This dough is NOT good! It's extremely bland due to the lack of time spent rising. The yeast doesn't have anytime to develop and throughly prove in the dough. The result is a crispy flat tasting dough. If you want a really good pizza dough take the time to let the dough rise and punch it down and rise again. Via the coolest pizza recipe I have found. Thanks for sharing it! Can you freeze this dough? can i use any oil other than olive oil? Can I use vegetable oil instead of olive oil? Can u freeze the other half? This is a good soft, thick, puffy crust. I was expecting it to be more thin and crispy. This pizza crust is amazing. I have used it twice and it never fails. I have used both all-purpose and bread flour with great results. I bake in the lower portion of my oven (without pre-baking the crust as other commenters have suggested) and find that even with loads of toppings, it cooks all the way through and gets super crispy. Love this crust for a quick dinner. I roll individual pizzas, thin, and put them right on the grill, no oil or pan on the grill. I do put olive oil on my rolling sheet. Flip them once and you get nice flat bread (it does not stick). I do this ahead of time and usually freeze some. Then just add your toppings and put them back on the grill just until the cheese melts. Thin, crispy crust and delicious! We like pesto and feta cheese on ours. This dough is so easy and delicious! It was a little salty so next time I may just reduce salt. We had enough for two large pizzas. We ended up using extra dough for cinnamon rolls and they were also delicious! I am trying the recipe again now using whole wheat flour. Thanks for the great recipe! This is the pizza dough I've been waiting for! I have tossed all other recipes, and I have been sharing this one left and right. Not only is it fool proof and perfect every time, it's also FAST! No waiting for hours for the dough to rise. It's perfect when I need a quick dinner, and the kids love it. We like our crust a big thicker, so I let it rise again for a few minutes after putting it on the pizza pan. This makes two huge pizzas for us. Sometimes I make one pizza and use the other half for cheesy breadsticks. Or I make a cinnamon dessert pizza with the other half of the dough. And I just figured out that it makes quick and amazing cinnamon rolls! And tastes just like the more time consuming ones. Just roll out the dough into a rectangle, spread with softened butter and a cinnamon-sugar mix, and then roll up and slice and bake just like any other cinnamon roll. I'm about to make another batch right now. Put a simple frosting on it after baking, yum! And they reheat beautifully in the microwave, makes them taste like fresh from the oven. 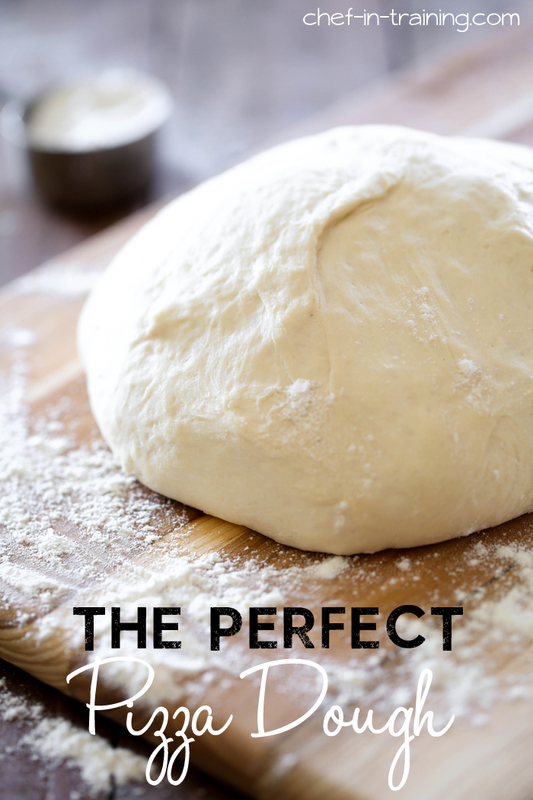 Perfect dough indeed. It was too salty, I had to throw it al away. The recipe should have read 1 tsp salt not 1 tbsp. I agree, it was so salty it made me sick. Do you think you could make a calzone with this? Want to try this as a quick different options to add to the slim pickens list that my three kiddos pick from to eat! I would have to mix the old fashioned way though...by hand! Lol Think that would make a difference...? I'll give it a whirl anyways just to see.....mix with love, hope for the best right! Thanks! hi, can a use vegetable oil instead of olive oil?thanks! I tried this and it was perfect. Thank you. Do you have a recipe for big soft cinnamon buns that don't dry out? Hello, I'd like to ask if you use dry yeast or fresh yeast? can I make this dough with whole wheat flour, or whole wheat pastry flour? is it suitable for cinnamon rolls ?? Great dough recipe. When I make pizza the top gets done before the crust on the bottom gets crispy. Any suggestions are appreciated. I use a conventional oven and put the cookie sheet on the middle rack. Thanks. What size of pans do you use with this? BEST pizza crust EVER!!!! I have been looking forever and finally found it!! super quick and easy!! I need your help BAD!! i tried making pizza dough with all purpose flour followed the right steps EVERY time my pizza dough "fluffs" and then "collapses" like literally the air leaks out of it! It returns to it's original size. The dough is sticky afterwards and does not rise when baked. I even proof the yeast before to make sure its active. I do not know what i am doing wrong?! too much yeast? too watery? flour too thin? i cant understand. My mom tells me to add baking soda but i think the YEAST should do its job! PLEASE HELP ME I HAVE FAILED TOO MANY TIMES!! I love this recipe! It is easy to make and turns out perfect everytime. This is my go-to recipe for pizza dough and breadsticks. I have pizza night with my family and friends once a month. I make the dough, everyone gets a ball and makes their own personal pizza. They are always impressed with how good their pizza tastes and it is all because of the crust. Thank you for sharing this recipe. Terrific recipe. Great flavor & texture. I used 1 packet of active dry yeast in the water with a bit of honey but otherwise followed the recipe. Yielded enough for 2 large or 3 personal sized pizzas. Do you use rapid rise instant yeast or the regular yeast for this dough? I have both and am unsure which one to use ? Well.... it may be fool proof. But I forgot to add the salt!! 😲😲 we'll see how it turns out when it's done! No doubt about it. This recipe IS foolproof--because I made it and it turned out delicious! No changes. Made it exactly the way you said. Thanks for a quick and easy pizza dough! Approx what size pizza does this recipe make? What kind of pan for baking? Do I need a pizza stone? Should we preheat the pan? Thanks! What were the sizes of the pans? Forgot to take a picture, but my kids said this was the best pizza dough ever! And that was from 4 teenage boys who have eaten a lot of pizza. It was super easy and I even rolled it out on the cookie sheets for one less step. Love this pizza dough! It's quick, easy, and delicious! Thanks for sharing! Thank you for this recipe! I will have to try this as I've been looking for a go to pizza dough for the family. Do you use a regular pizza pan or a stone? Can I mix this by hand? College student here with out a mixer. This is an awesome recipe & the way you mix is so easy. I have a recipe similar that I've been doing for years , pretty similar. I was at my daughter 's home last July in Seattle & we decided to make pizza ... but I couldn't remember the recipe so I used yours & it came out delicious & not too time consuming & elaborate to prepare!!! Loved it!!!! Is it possible to use sourdough starter instead of yeast please? I am trying it with semolina flour only. Let you know how it works out! I used your recipe butreduced the salt to about 1/2 tsp and it came out perfectly. Thank you for the recipe. Hi, what kind of flour did you use? Does it have to be Olive Oil & what type of Yeast?? Don't know alot about Cooking lol!!! Thanks for this recipe, have used it twice now, with great results! This is a pretty standard pizza dough recipe. I usually use 500 grams of flour. Sometimes I will substitute 100 grams or so of white whole wheat or add a couple of table spoons of wheat bran and wheat germ. I add all dry ingredients to my 14 cup food processor. Turn the machine on and add oil and water slowly until it all comes together in a ball, no more than 60 seconds. Give a piece the window pane test and if it passes remove it to the counter and divide it into two equal balls. If I'm making a large pie (16" dia. or more) I don't divide it. When I divide It I often make one 12-13" pie and a small loaf of bread. Loved the recipe and guidelines. However, there is way too much salt in the recipe. I think it should be made with one teaspoon of salt. I honestly only used half the amount of salt called for here and it was still too salty for my liking. On the other hand, this is a great recipe for anything actually with an adjustment of salt. It was perfect!!! I added 1/2 Cup of water to the recipe. I covered the dough with 1 Tbs of olive oil and let the dough rest in a ball for 4-5 hours. Also, I baked it on oven stone under 500 F. It turned awesome and delicious!!! It is the best pizza dough recipe that I have ever tried! My family and I loved it! Thank you so much!!! Thank you for so delicious recipe. I made your pizza dough lastnight for dinner and it turned out beautifully. Seriously so easy, delicious and could be used for many other things than pizza. Can't wait to use it again! Well, our Christmas tradition is homemade pizza on Christmas day. My son uses a recipe that needs to rise in a warm oven for an hour. I mixed up the ingredients from your recipe, covered the bowl and set it on a heat register (I actually forgot about it, so it sat longer than the 10-20 minutes). I pulled the dough from the bowl, looking no where near as beautiful as yours, placed it on the counter and divided it in half (cookie sheet). Ended dividing the other half in two for two pizzas in cast iron frying pans. I will NEVER buy a boxed pizza mix again! BEST DOUGH/PIZZA EVER !!! I would have posted a picture, but the pizza didn't last that long. Thank you SO much-it was Delicious !!! I made this recipe last weekend when the store was out of pre-baked pizza bases. I am a pizza dough virgin and have to agree that this is a very simple and foolproof recipe. Thanks for sharing. For convenience I wanted to make and freeze a batch of these. Is this possible? If so, would you shape to fit the tin and freeze raw or do they need to be baked blind first. Perfect every time. So easy to make. I sometimes have to make it ahead of time. I pop it covered in the fridge and pull out 15 minutes before rolling out. 1 did everything as recipe but pizza after oven become so hard and wasn't eatable . My kids complained that the pizza crust was too salty. Next time I’m going to cut way down in the salt. I’ve never made pizza dough before. I don’t have a kitchen aid mixer. Could I use a large spatula instead? Thanks! I use active dry yeast. Let me know how it turned out with instant- i'd love to know! I’ve made this quite a few times now and it’s consistently good. I use a wholemeal flour which gives a great flavour. I like my crust super thin so I find this recipe will make three crusts. I have frozen it, but find the thawed dough doesn’t crisp as well as fresh dough. I’ve also experimented with part baking before topping to prevent any sogginess, with mixed results. The first time it was really good and last time it went a bit chewy. I’m going to make it again tonight, in honour of national pizza day and will cook fresh without part baking before topping. Hoping for a good one! Thanks for the recipe. This is my second time using your wonderful recipe! I made it this time with half 00 Italian flour! I can't wait to see if there is any difference! Great recipe! This was my first time ever making pizza dough and it turned out PERFECT. I’m new to the baking game and was super intimidated to try dough and this recipe was so easy, fool proof. I have no desire to try any other recipe- THANK YOU! my package says to only mix yiest with 1/4 cup water not 2 cups? it is 1 tablespoon in a package. help? Just wanted to say thank you for the great recipe! I am not a whiz in the kitchen and won't spend hours to prep a meal either. This was fast, efficient and tasted good. I only had half regular flour and used half rice flour & still turned out delicious! Do you use instant yeast or traditional? I finally tried this recipe, it was truly perfect. Thank you very much! Well, the recipe was super simple and easy. It looks and feels like pizza dough. And if the comments are true to form then it’ll taste good as well. I don't have a Kitchen Aid or a bread hook. Could I mix it with a wooden spoon or something? Best ever! Will never buy store baught pizza again. I bought instant yeast. Is there a difference? Is this all purpose or self rising flour? I’ve never made dough before but I want to start after reading the ingredients on the back of pre packaged dough. Does this make just enough for one large pizza or more? How many pounds of dough is this? Silly question I know but I’m no good a cooking. Am I supposed to use active dry yeast or rapid rise yeast? I got both just in case? This pizza dough is perfection! I have been making dough for many years and was looking for a new variation to try, this is now my go to pizza dough. Easy to make and so soft. We grill pizza a lot and this works perfectly. Thanks for sharing! If making ahead, or freezing at which step do I stop? Before it rests or after? Does it matter if you leave it to rise for a few hours? Thank you! This recipe saved dinner last night! It was easy, and quick, rolled out easy, and tasted awesome! this recipe doesn't call for sugar :) I am so glad it turned out! how thin should I roll the dough out? Self rising flour I assume? Or all purpose? I’ve made this a few times before and it always comes out perfect but I messed it up last time! 😂 I think my yeast wasn’t proving because it was either old or the temperature wasn’t right in the water (too cold?). I’m making it again tonight so hopefully I won’t mess it up again lol! We found this recipe after many failed attempts to get pizza dough at our local grocery stores - they were always out! We made it and have never ever gone back. It is so yummy and makes the perfect amount of pizza. We make it on the grill! I made this today but the dough was tearing. What am I doing wrong? Can I use this pizza dough for a deep dish pizza? Hi, this sounds like ALOT of flour. How many pizzas does it make? How many crusts does this make? 1 or 2? Made this tonight and it turned out great! Was shocked how easy and quick it was! We made this tonight, and it was fantastic. The crust was crispy and held up to the toppings, hut wasn't dense. We even pulled some aside and made bread sticks! Thank you such an easy and quick recipe! About how many pizzas would this make? Doing new years eve mini pizzas for 6 adults and 6 kids at minimum. Trying to decide if I should double. Dough feels super hard I don't think it's going to soften up at all. Also you don't State how long to leave it in the KitchenAid mixer. When do you add salt!! Any idea what the nutritional info is on this? This recipe was posted a while ago, but I have only been using it for a month or so. It is perfect as written! No sugar needed, the dough will rise as desired. I use a Pampered Chef rectangular pizza stone, and this makes enough for two crusts. I use one and freeze the other half in a plastic bag. Thaw in refrigerator or on counter, depending on how much time you have. Thanks for my new go-to pizza dough recipe! We top with sauce, a sprinkle of oregano, parmesan, spinach, peppers, onions and tomatoes. Bake 16 minutes @ 400, sprinkle with mozzarella and bake 4 more minutes. Delicious! Hello! I will make the attempt to make this dough. Is it elastic to where I can Ross it up and stretch it as most chefs do? Just wanted to make sure that it is 1 Tablespoon of salt for the 5 cups of flour.Just a side note ,I am familar with active dry yeast,just wanted to know if the packets of yeast have the same in them,as I live in canada ,would the dry yeast packets have the same amount in them? I’ve always struggled with pizza dough for some reason. This recipe was perfect! My daughter is a pizza snob and she LOVED this dough! I made one pepperoni pizza and one garlic cheesey bread. Yum! Thanks for the recipe! After looking a long time for quick and easy homemade pizza dough recipes, I decided to try this one. I made it tonight for dinner and it was simple, quick and delicious!! We like a crispier crust so I baked the crust it for 7 minutes before adding ingredients then followed the regular baking time. I made two pizzas out of this recipe. I was even able to shape one pizza crust into a heart for an early Valentine’s pizza. ❤️ Great recipe, thank you for sharing! Love this recipe. I make it and divide it in to three pieces. I use one fresh and freeze the other two so always have a dough base on hand. I think a video would help. I made this exactly the way I thought I was supposed to but the crust didnt cook through except at the edges and I have no idea why. So good. I added some garlic powder and oregano too. It was really hard for me to roll out so it was very thick. Do you think less flour would help? I left it in the fridge for a few hours until I needed it and it rose again. Do you think that could have caused it to be thick? Love this recipe! We've made it many times. The kids enjoy making personal pizzas with it.